Drip campaigns are a great way to engage newly subscribed users and increase the value of your mailing list. They’re known by a vast number of monikers – drip campaigns, automated emails, lifecycle emails, autoresponders and marketing automation – but the concept is the same. They’re a set of marketing emails that will be sent out automatically on a schedule. These emails can be applied to a vast number of businesses and you’ve probably received hundreds of examples in your own inbox. E-commerce businesses often use them to welcome you to brand and then offer a discount. Many blogs use them too, to share their most read content with new subscribers, ensuring you haven’t missed a thing. We also use them here at EmailOctopus, to welcome new users to the platform and ask if they need any assistance in getting set-up. This blog post will run through a few examples of drip campaigns and how you can apply them to your own business. A good welcome email is a great place to make a first impression on your subscribers. It’s a great place to get across the message of your brand and set the expectations of your website or company. The example below from Ace & Tate welcomes their new subscriber and includes the selling points of the brand such as their offer of free shipping and try-on incentives. First impressions are so important so be concise but get across your message. 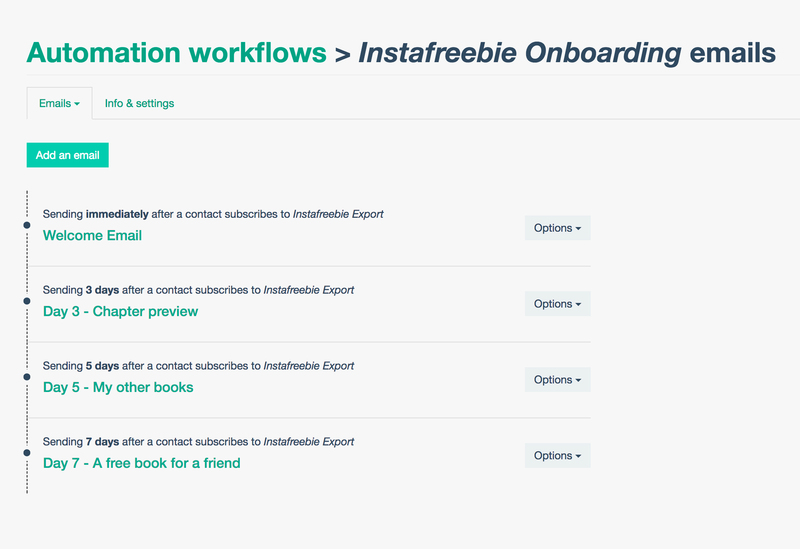 If you have a particularly complex product then an onboarding drip email series can be a great way to introduce users to the multiple facets of your business. Think of it as a tour guide for your website, supplementing the information which appears on your site. Ensure you offer users a way to opt-out of these messages, as for many users they may become irrelevant as you onboard them. 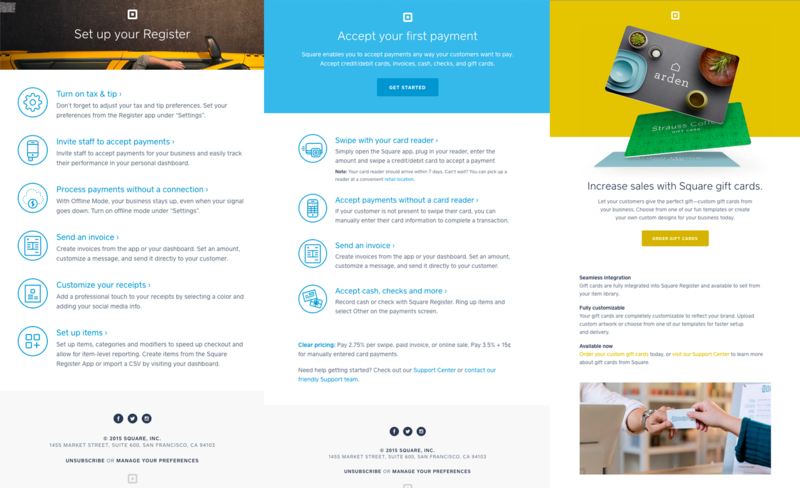 We particularly liked this sequence from payment processor, Square, which takes their subscribers through the process of being able to accept payments all the way through to upselling customers and increasing sales through gift cards. Lots of e-commerce sites offer discounts to their new subscribers and this is also you can do this using drip campaign. You may choose to include a discount in your welcome email, as Tattly do in their example below. Alternatively, you may choose to wait a number of days to do so, or even add them to a list if they purchase, inviting them to come back and purchase more for a discount. Discounting can be a powerful way to generate incremental sales for users who may have just had the intention to browse. Use scarcity or urgency, by limiting the discount code for a certain amount of time, helping encourage your subscribers to complete their purchase there and then. Drip campaigns aren’t just limited to use in e-commerce or for blog owners, they can be a great way to educate subscribers. 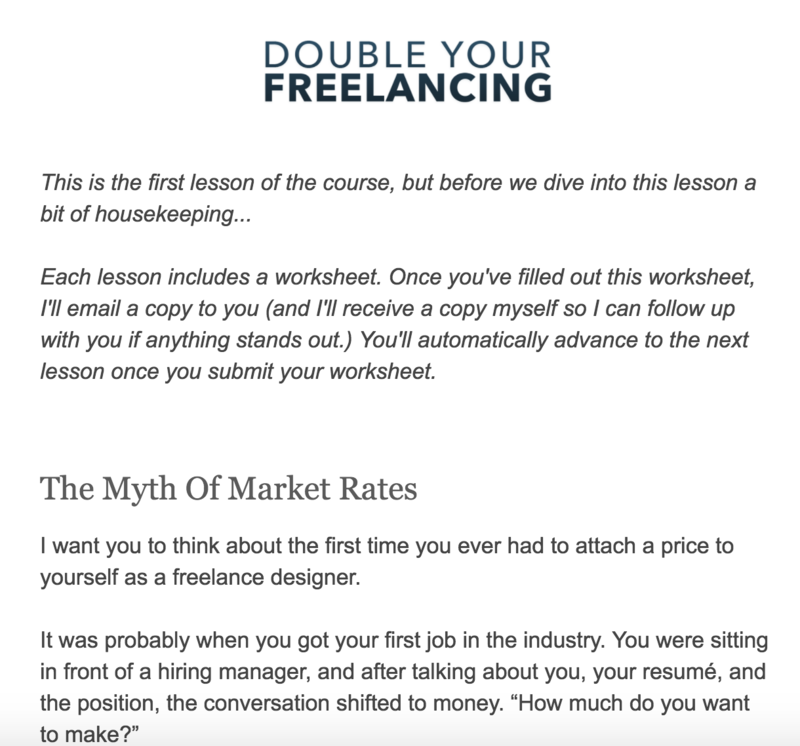 A number of online courses, such as “Double your freelancing” use email courses to help educate their readers. Email courses are a great way to build up authority with your readers. 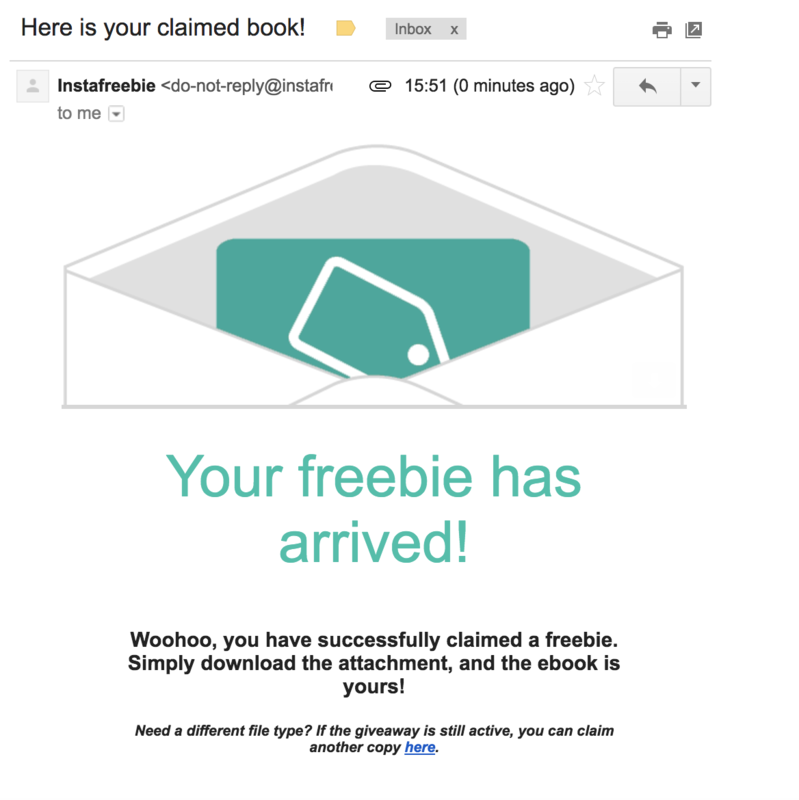 For authors, drip campaigns are a fantastic method of teasing your content to your readers. Increase your sales by giving a new subscribers access to an exclusive chapter preview of your latest book, then seek to convert them by using further drip messages perhaps ending with an exclusive discount. 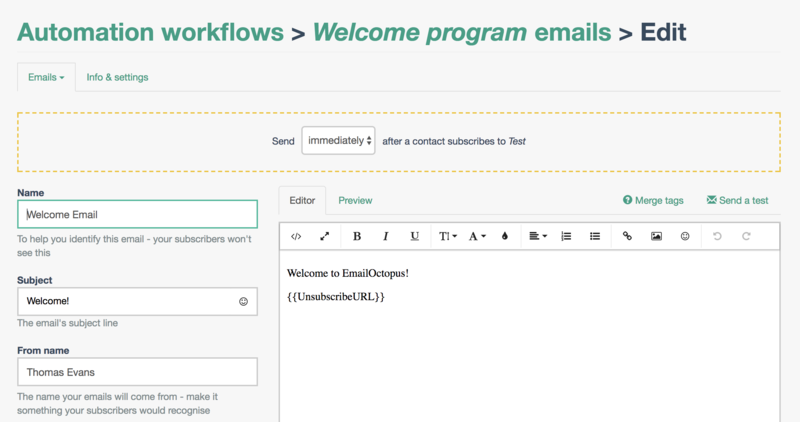 EmailOctopus supports the use of drip campaigns, via our Automation. Through our simple interface, we aim to make it incredibly easy to set up a series of time-based automations which can help convert your subscribers and keep them engaged. A fully fledged sequence, which will begin when new subscribers join a list. 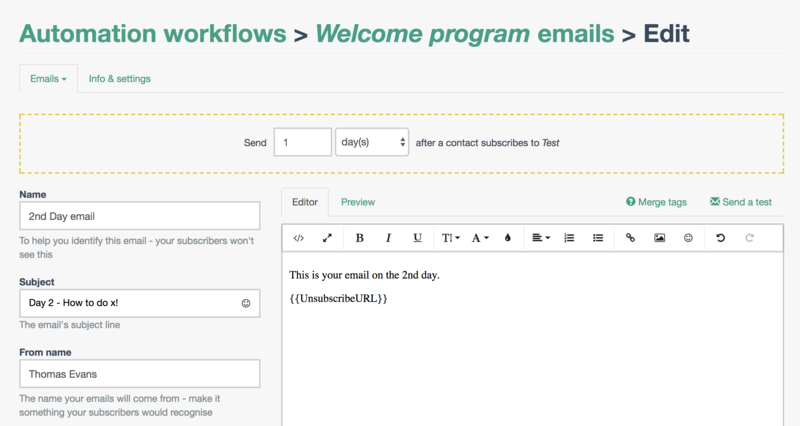 In five steps and only a matter of minutes, you can build a fully fledged automated sequence to welcome and engage your subscribers. Why not give it a go today?